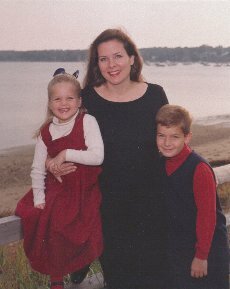 Anyone who’s heard me speak has been regaled with stories about my children. Their keen observation skills and candor provide me with a plethora of material. They are always watching and they are the first to call me on hypocritical behavior! At the end of the school year my son, Woody, age nine, asked permission to bring home one of the class fish. I groaned inwardly and muttered, only half-jokingly, "Why doesn’t Mrs. Peterson just flush those fish!" "Mom!" he cried, horrified. "I thought you were the politest woman in Hingham!" "Speedy" the fish joined our family the next day. Many of you know my father is the world’s only three-time Memphis In May Barbecue Grand Champion. Ironically, he’s gained fame serving sticky, finger-licking good ribs while I make a living demonstrating proper dining skills and cautioning executives to never lick their fingers! 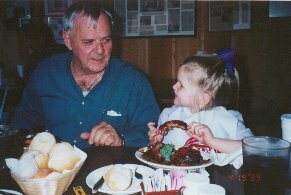 Faye, age five, gets a lesson from her grandpa, Mike Mills, on eating ribs in the proper manner.